Even she can’t believe it. “Is it? Wow…” Definitely. “Although on the other hand, it feels about 10.” More like five. 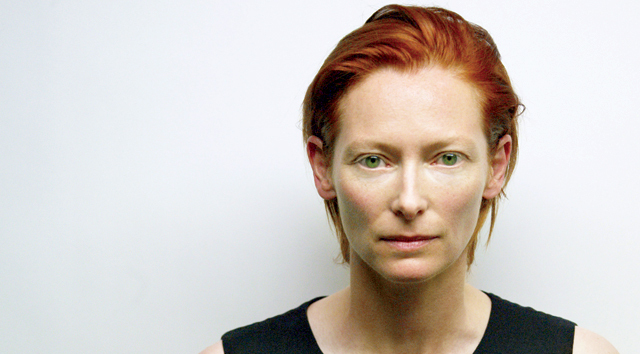 “Yeah… But maybe five.” It’s definitely five, five years since Tilda Swinton last stared into an i-D camera. Back then, back in 2003, we celebrated her as Britain’s most unique icon of avant garde style: actress, artist, mother, model. The rest of the world has finally caught on. She was declared one of the 10 best dressed women in the world by Vanity Fair last year. She’s starring on the cover of Italian Vogue. She was recently photographed by Juergen Teller at home in Scotland. Cameras love Tilda Swinton – and she loves them back. Standing against a white screen as i-D photographer Alistair McClellen frames in on her face, it’s little surprise to see Swinton taking charge of her own shoot. She decides on a striking double make-up contrast: one spare and stripped-down, one full and dramatic. “Would it help if I put my hand here?” she asks, scooping a flame of strawberry hair off her cheekbone. Of course, it does. Well, quite. In a three-decade career of screen and style, Swinton has continued to morph with gripping unpredictability. Her new film, dark thriller Julia , is different again. We first meet her rolling drunk in a bar, long hair flung everywhere, make-up blurred with sweat, sloshing her booze as she sways through a long, lost night before prising open her bloodshot eyes to a parched, sticky morning-after. Did we say icon of style? Easy to see why. Harder to imagine what next from a woman who once lay her sleeping in a glass case on public display for a week, has juried for international film festivals in Cannes, Venice, Sundance, and this year created her very own film fest in her small Scottish home-town. Lasting eight and a half days, ‘The Ballerina Ballroom Cinema of Dreams’ saw her unspool classic and rare films for the local community. Adults paid three pounds. Children paid in home-made cakes.